Rendering of Hines’ 609 Main at Texas building under construction in downtown Houston. HOUSTON – Hines has landed the Kirkland & Ellis law firm as its initial tenant in the 48-story office tower it is developing in downtown Houston. Hines, the international real estate firm, announced Kirkland & Ellis LLP has signed a 62,000-square-foot lease at 609 Main at Texas building. Kirkland & Ellis was represented in lease negotiations by Chad Baker and Steve Burkett at JLL. Colvill Office Properties represented Hines, the building developer, owner and manager of the speculative office tower. 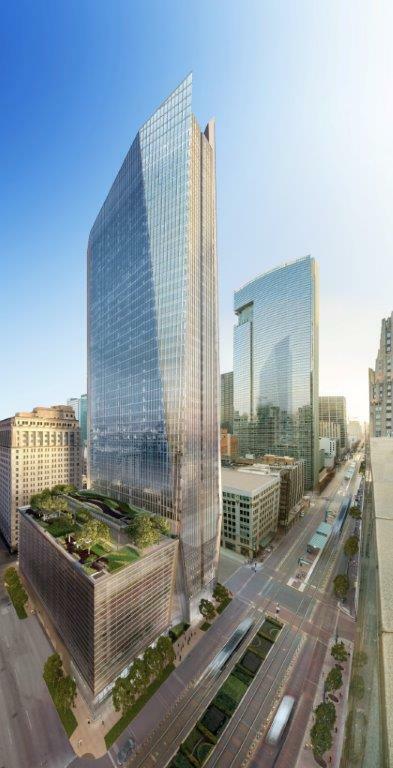 The 1,050,000-square-foot office tower will be complete in early 2017. Upon project completion, Kirkland will relocate its 75 Houston office employees to the building from 600 Travis Street. Designed by the internationally recognized architectural firm Pickard Chilton, the project will be highly visible downtown landmark. The property is pre-registered LEED, and is expected to attain Platinum certification upon completion. Kirkland also leases more than 674,800 square feet in Hines’ 300 North LaSalle in Chicago and 3330 Hillview Ave. in Palo Alto, Calif. The new Hines tower is about a block away from the Houston Chronicle building, 801 Texas Avenue, which Hines recently acquired for a new development in the future.